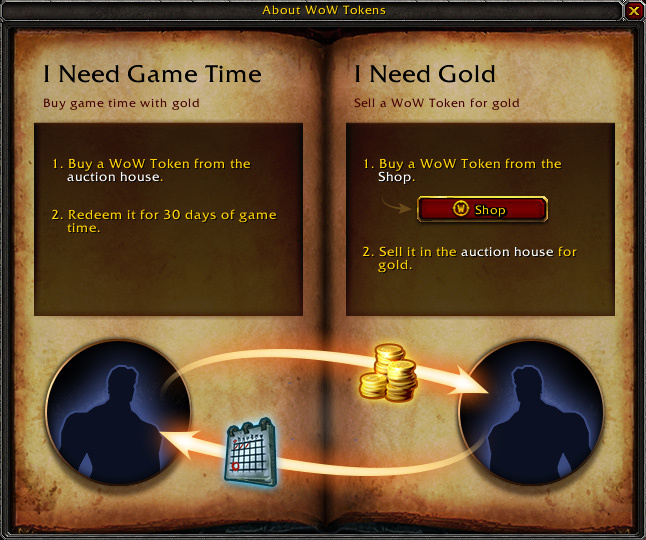 Blizzard announced that the World of Warcraft store will now offer the "WoW Token", which can be purchased for a TBD amount of fiat money (or bitcoin? ), and then sold on the auction house to players seeking game time. Illegal gold sales: The gold sellers underground will now have to compete with a completely secure and effortless way of exchanging gold for real currency. Blizzard's hope is that this will reduce demand enough to nearly eliminate the game currency black market. Eliminate Surplus: It's hard to balance the game around players who have a major surplus of gold. Being able to trade gold for game time will reduce the number of players with abnormally high amounts of gold, making it easier for WoW to manage accessibility of gear, etc. From a game industry morality standpoint, Blizzard is attempting to take the higher path. Instead of just straight-up selling gold, they are taking a hit on the revenue made from subscriptions, as people buy these tokens at a discount (I assume between $5 and $10 per token). Again, this is TDB on the actual token price.